Weekend brunches are quite possibly the best thing ever. When we stumbled upon this recipe we were sold! 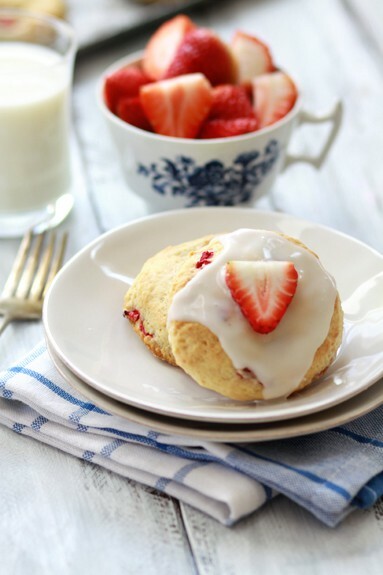 I have a carton of strawberries fresh from the farmers market just waiting to be used for these scones. Definitely adding this to the brunch menu this weekend. yum. Zest the lemons and combine with the sugar in a small bowl. Using your fingers, rub the sugar and zest together to combine. This will help release the oils and aroma of the meyer lemons. Combine the flour, baking powder, sugar (combined with zest), and salt. Cut the butter into the flour mixture until it resembles coarse sand. In a small bowl, whisk the eggs, lemon juice, buttermilk, and vanilla together. Stir the egg mixture into the flour mixture until the dough is moist, but do not over mix. Turn the dough out onto a floured surface and knead a couple of times until the texture is more uniform and the dry bits have been incorporated. Roll the dough out into a large circle (or approximate) that is half an inch thick. Sprinkle the chopped strawberries on top, then roll the circle up. Fold the rolled tube into thirds. Then, roll out again into a half inch thick round. Using a biscuit cutter or a glass, cut out scones that are about 2-3 inches in diameter. Place cut scones on the prepared baking sheets. Continue cutting, re-rolling scraps as needed, until all the dough has been used. Alternatively, you may divide dough into two equal balls. Pat each ball into an 8 inch circle. Place each ball onto a parchment paper lined or greased cookie sheet. Score each circle with a knife into 6 wedges. Bake in a 375 degree oven for 15-20 (for cut scones) or 30-40 minutes (for the 8 inch circle), or until done and lightly golden. Allow the scones to cool completely. Meanwhile, stir powdered sugar, milk, and lemon juice together. Drizzle over cooled scones. Scones may be frozen for up to a month (un-glazed) in a ziploc freezer bag. Happy weekend loves! Don't forget to enter in our e-design giveaway... the winner will be announced one week from today!! Yum! I am a huge fan of scones. And, I always seem to need a use for strawberries before they go bad. This will be perfect!